Croagh Patrick Hostel has beautiful & very spacious bedrooms/dorms, all ensuite. We cater for individuals, couples, families, small & large groups. We offer guests free continental breakfast in our stunning dining room each morning. A stove turf fire in the trendy lounge will add to the comfort & character of your stay. You are welcome to fix a snack, lunch or dinner in our fully equipped self-catering kitchen. A meeting/activities room & drying room are also available. Enjoy the spectacular views of the majestic Croagh Patrick Mountain from our outdoor terrace area. We also have a tuck shop. It is the perfect venue for individual travellers, family gatherings, work/school/college bonding trips, sport training trips, walking groups. Can organise activity packages! 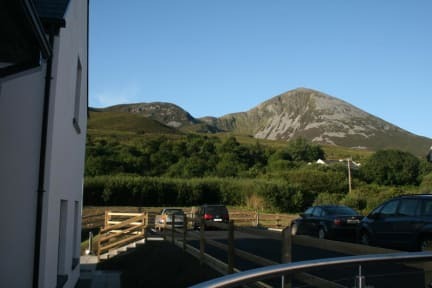 Croagh Patrick Hostel is ideally located at the foot of Croagh Patrick Mountain in the beautiful picturesque village of Murrisk, 7km from the cosmopolitan town of Westport in Co Mayo. Only a 2 min stroll from the start of the ascent to Croagh Patrick Mountain. Croagh Patrick Hostel is located on the Wild Atlantic Way Route & the Great Western Greenway. Also perfect location to explore the many beaches & islands of Clew Bay. Main transport links are in Westport, 7km away. Murrisk on bus route. The bedrooms size will sleep 3, 5, 6, 7, 8, 10, 12 persons. Each bed has its own individual reading light for comfort & convenience. Lockable storage units & ample plug/USB sockets are available in each bedroom. Reception is open until midnight. 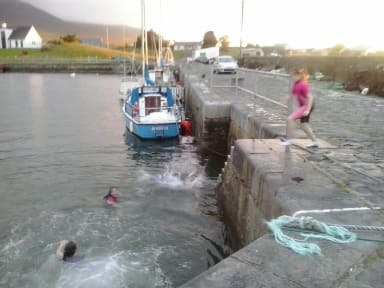 Croagh Patrick Hostel is suitable for individuals, families, groups, etc of all ages.